You are cordially invited to Opening reception of the a Special Muti Artist Art Show; "Expressions on the Wall - II"
Viewing art and to appreciate its meaning involves a dialogue between expressions of the artist and the material properties and his/her thoughts. 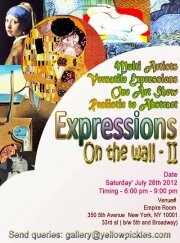 "Expressions on the Wall - II" is a collaborative effort of NYC-based artists Lewis Folden, Barbara Recheko, Douglas Newton, Carolyn Oberst , Bhavna Aggarwal, Pavida, Preet Srivastav and more who will showcase a collection in various mediums as oil, acrylics, chalk, etc influenced by concepts that connect various schools of art to the contemporary world. With their unique diverse backgrounds and style they collectively hope to refresh the neglected literacy of natural expressions while stretching the thoughts of themselves and of the observer. This multi artist exhibition will feature works dedicated to the form, color and symbolic meaning of diversified themes. Timing - 6:00 pm - 9:00 pm.